If you’re considering cutting your lawn the new-fangled, old-fashioned way, get the 411 on today’s easy-to-push manual mowers. Manual reel lawn mowers may invoke nostalgia for the good old days before powerful riding versions arrived to wake the entire neighborhood on Saturday mornings. But believe it or not, reel mowers are making a comeback among homeowners with yards 2,000 square feet or less. One big reason? Modern reel mowers are a lot easier to push than their vintage counterparts. So whether you want to reduce your carbon footprint or simply save money on a mower, keep reading. We’ll provide pros and cons and explain key features to help you decide what’s right for your space, and then share our top three picks for the best reel mower based on reviews by consumers like you. 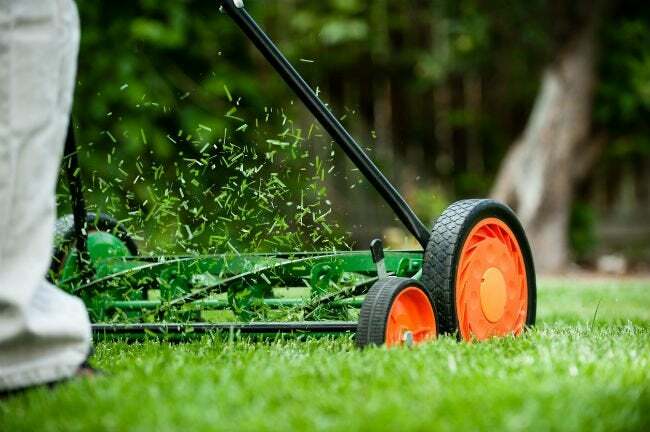 Gas- or electric-powered rotary mowers have blades that spin horizontally (parallel to the ground)—and have a tendency to literally beat your lawn. The result is torn and battered grass that is susceptible to diseases. On a reel mower, the cylinder rotates in a forward motion, trapping each piece of grass between the blades and a cutting bar, resulting in a sharp cut similar to what you’d get if you went at the lawn with a pair of scissors. Less damage is done to the leaves, so the risk of disease is lessened. Reel mowers are almost always powered manually; the physical pushing of the mower turns the blade cylinder, which cuts the grass. A limited number of electric and cordless models are available, but the extra power merely turns the blade cylinder without propelling the mower forward, so consumers may actually find these heavier-duty machines to be more difficult to push than manual models. Because they’re push-powered, reel mowers excel when cutting fine, straight-growing grasses but can bog down in thick, wiry grass. Easy-to-cut varieties include perennial rye, Kentucky bluegrass and fescue; thicker species include Bermuda, St. Augustine, Zoysia, and Japanese lawn grass. reddish pustules that form on the grass and can rub off on clothing. Inexpensive relative to gas and electric mowers, though price varies based on quality and design. the model, and lubricate the gear assembly (which differs by type, so check your owner’s manual) at the beginning of each mowing season. Easy to store—smaller, lighter models can be hung on a garage wall. Free of exhaust and fumes. Mowing swaths (the width of a single pass with the mower) are relatively narrow (15 inches to 20 inches), which means it takes quite a few passes to mow an entire yard. Not designed for mowing thick grass, which can clog the blades. Even small twigs can get stuck in a reel mower, so the lawn should be raked of debris before mowing. Blade cutting height: On some less expensive reel mowers, cutting height is pre-set, often at one and a half to two inches. Many other models offer adjustable cutting height, from one-half to four inches. Before buying, consider the variety of grass in your lawn and its optimal growing height. For example, if you have a tall variety of grass, the best reel mower for your yard will cut at least three to four inches high. Swath width: Standard swath widths on reel mowers range from 15 inches to 20 inches. While a wider swath width means you won’t have to mow as many passes, it also makes the mower more difficult to push, because more grass means more resistance. Number of blades: Reel mowers feature between four and seven blades on the reel. The more blades, the cleaner the cut, but more blades also require more push-power to run the mower. For most lawns, mowers with four to five blades work well. After comparing comprehensive research of customer reviews and ratings to some of the key shopping considerations we’ve outlined above, we’ve narrowed the market to three top picks. Homeowners looking to get their hands on the best reel mower would do well to start with the following manual reel mowers. For affordability and mowing ease, it’s tough to beat the Great States 16” T-Handle Reel Mower. Amazon buyers award this model a hearty 4.2 out of five stars for its smooth cutting operation and its cushioned T-handle that makes it easy to maneuver around corners. Its light weight of 26 pounds makes it easy to push as well as hang on a garage wall for storage. It features five, heat-treated alloy blades that resist dulling, mows a 16-inch swath, and its grass-cutting height is adjustable from one-half inch to two and a half inches. The mower comes with a one-year limited warranty. Available on Amazon. 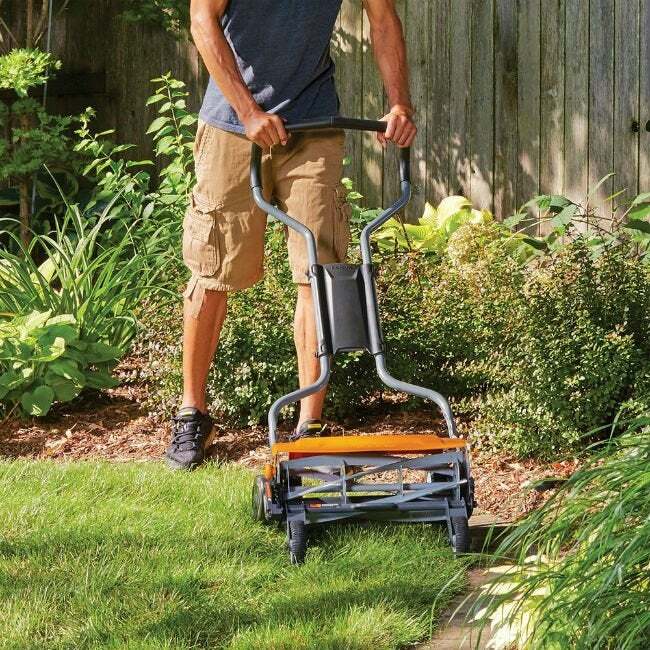 With an 17-inch cutting swath, the Fiskars StaySharp Plus Reel Mower gets the job done quickly. 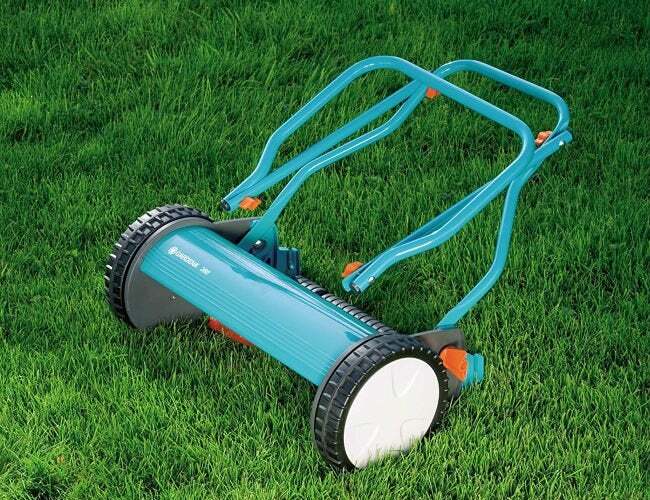 This mower boasts StaySharp blades that keep cutting for years without needing re-sharpening. It also includes InertiaDrive, an innovative design that helps the mower power through thicker grasses. Cutting height is adjustable from one to four inches and there’s a directional chute so you can direct clippings to fall in front of the mower or behind. At 51 pounds it’s a tad on the heavy side, so you’ll probably want to store it on the floor rather than hanging in on a wall. 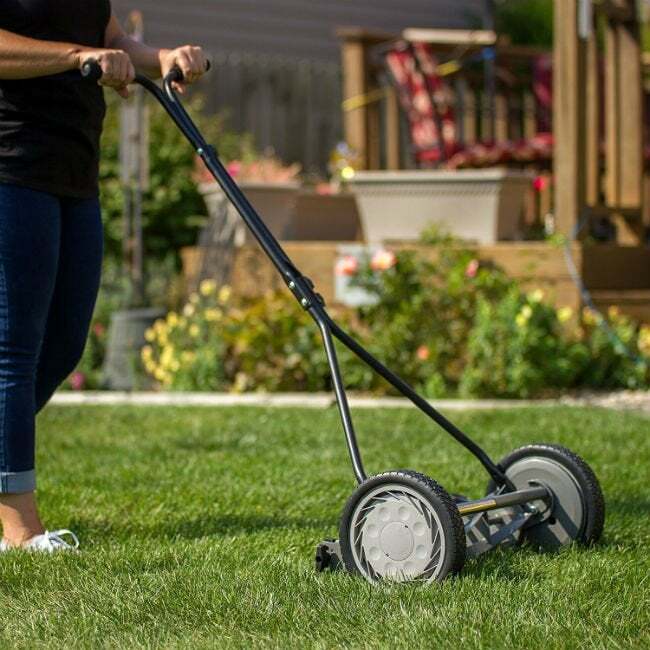 Amazon buyers give the Fiskars reel mower an enthusiastic 4.1 out of five stars, citing its ability to cut through even taller grass “like butter.” The StaySharp has a limited three-year warranty. Available on Amazon. For its great nostalgic look, super-quiet operation, and ability to cut grass blades with precision, Amazon buyers award the Gardena 15” Silent Push Reel Mower 4.1 out of five stars. At just 19.6 pounds, the Gardena is perfect to hang on a wall, and its collapsible handle allows for easy transporting in the trunk of a car or for compact storage on a shelf. Cutting height is adjustable from one to three inches, the five-blade cylinder and cutting bar are made from high-quality ground steel, and the blades are non-stick coated for easy cleaning. It comes with a one-year parts-and-labor warranty. Available from Amazon. Firewood Primer: Which Wood Burns Best?